ATD Dallas is the local chapter of the international ATD professional association. ATD is the world leading organization focused on the promotion and advancement of workplace learning and performance. Incorporated in 1980, ATD Dallas has over 400 members with a variety of backgrounds, including corporate directors, training managers, instructional designers, delivery facilitators, OD specialists, e-learning specialists, external consultants, and newcomers to our profession. Member companies include Fortune 500 organizations, non-profits, government, and mid-size and small businesses. Why should ATD be your Professional Organization of Choice? Congratulations on your chapter meeting the Chapter Affiliation Requirements (CARE) for 2015! This means your chapter successfully met all 18 required CARE elements and is recognized for 100 percent achievement of CARE. 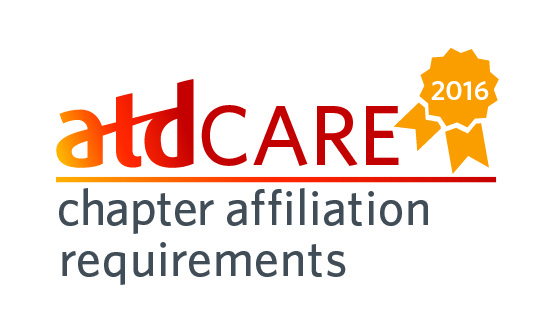 For more information on the CARE program, refer to ATD National's Chapter Affiliation Requirements (CARE) page.